Merry Christmas Set No. 2 design comes with a numbered diagram, a colour illustration, a pricking pattern and step-by-step instructions for the stitching. Patterns are delivered by download to your computer. The pattern size is 152 x 104 mm (6 x 4½ inches). 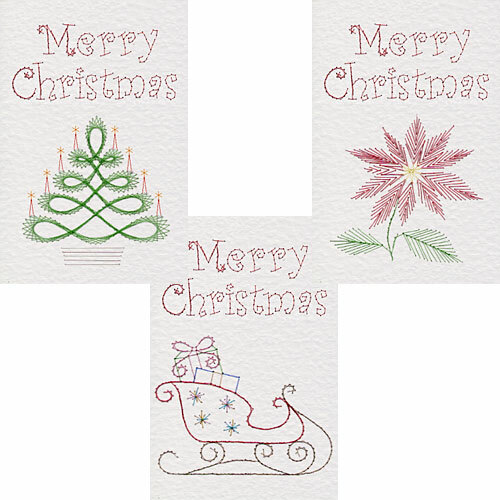 This product is a collection of three Christmas stitching patterns. They feature a fur tree, a poinsettia and a sleigh. The e-patterns are delivered by download to your computer in PDF format. Anyone, anywhere can open a PDF file. All you need is PDF reader software. This is available free from the Adobe website.